A peek into the mind-blowing works of Alexandro Jodorowsky! Visionary author, filmmaker, and philosopher, Alejandro Jodorowsky (El Topo, Endless Poetry) has created — along with some of the world’s most singular and talented sequential artists — an incredible Sci-Fi universe, full of love, revenge, intrigue, betrayal, and redemption. Told one series at a time, this wholly imaginative realm continues to expand on a cosmic scale. 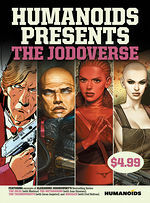 Featuring excerpts from The Incal, The Metabarons, The Technopriests, and Megalex, this collection provides a peek into this mind-blowing world that will ensure that you’ll want to hop onboard and explore it further…Welcome to The Jodoverse! This book is full color on glossy paper that the painted art just looks amazing on. I bought multiple copies to give to friends it is such a bargain. [...] I find this an amazing read as it reminded me why I love Jodorowsky’s writing so much. If you’re not familiar with Humanoids or these classic works, this is a smart way to make an informed choice of where to begin exploring. Fascinating and pioneering stories with transcendent art, across the board.